1 of 4 Pierce potatoes a few times with a fork and place in microwave. Microwave on HIGH for 8 minutes. 2 of 4 Cook broccoli following package directions. 3 of 4 Place shredded chicken and Alfredo sauce in a small saucepan and heat gently, about 4 minutes. 4 of 4 To serve, cut each potato in half lengthwise. Place 1/4 of the broccoli over each cut potato. 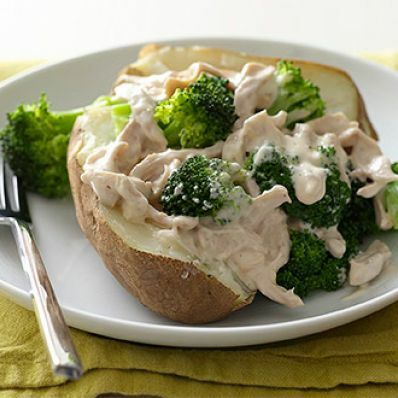 Spoon equal amounts of the chicken and Alfredo sauce mixture over each potato. Makes 4 servings. Per Serving: 437 mg sodium, 6 g fiber, 5 g sat. fat, 11 g Fat, total, 55 mg chol., 36 g carb., 339 kcal cal., 20 g pro.